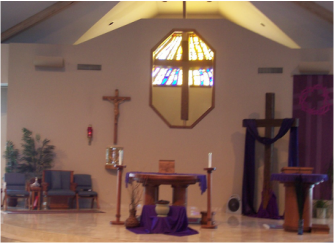 The parish of St Francis-St Maximilian was formed in August of 2006 by the merger of the parish of St Francis of Assisi, located in Ray Twp, Mi. and the parish of St. Maximilian Kolbe, in Macomb Twp, Mi. These two parishes had been clustered since January of 2002, and had spent several years consolidating their activities. The two parishes were located six miles apart along North Ave. in eastern Macomb County, and part of the North Macomb Vicariate. The St. Maximilian Kolbe Parish was originally formed in 1997, and established on 23 Mile Rd near North Ave. The parish was created to handle the increasing population in that part of Macomb Twp. and relieve the overcrowding that was occurring in the two existing parishes along 23 Mile Rd. : St. Isidore and St. Mary Queen of Creation. St. Maximilian established offices and a chapel inside a ranch home that was on the property intended for the building of a church. As the parish size grew, weekend liturgies were moved into the Activities Room at Higgins Elementary on 24 Mile Rd., near Gratiot Ave.
By 1999, the Parish Council recognized a need to provide ministry to the growing Hispanic population in eastern Macomb County and began celebrating a mass in Spanish, in addition to the three English masses. In 2001, the Archdiocese of Detroit put an indefinite hold on the plans to build a permanent church on the 23 Mile Rd. property. The Parish Council, faced with an indefinite period of celebrating Sunday liturgies at the elementary school, which was already overcrowded, approached the parish of St. Francis of Assisi, located six miles north, about the possibility of clustering. At that time St. Francis had a new church building in Ray twp. but did not have a permanently assigned pastor. This was an opportunity to cluster a parish without a church and a parish without a pastor together. The Councils of the two parishes agreed to move forward with this plan in January of 2002, and we began celebrating mass jointly in the St. Francis of Assisi Church at Easter of 2002. St. Francis was first established as a mission church by it's founding Pastor Fr. Francis Juras. The first mass was held in a rented home on Main street in May of 1951. On Feb 6,1955 the first mass was celebrated in the new church building located on 10 acres near Gratiot Ave., in the Village of New Haven. Priests from the neighboring Parishes of New Balitmore and Richmond served the needs of the mission until 1968 when St. Francis was given Parish status. Fr. James Curtin was the first Pastor, and served approximately 12 a half years.As the area grew, St. Francis became more and more surrounded by commerical and industrial development. It was decided that rather than continue at the present site, the church should re-locate to an area where more residential growth was projected to take place.In 1998, the move to the new building was constructed. Fr. Daniel O'Sullivan was Pastor during this time. The new church was dedicated in Nov. 1998. We continue to operate in Ray Twp., after clustering with St. Maximilian in 2002, and finally, merging in August of 2006 to form the Parish of St. Francis-St. Maximilian.